Yesterday I taught my adult Sunday school class. I brought the book featured below from the PBT archives. I chose it because a hibernation period is in the plot. This is a great metaphor to explore as we approach Lent, the liturgical season in which we remember Jesus’ 40 days in the desert. First, I explained that it would be a lesson with no discussion until the end because I wanted the quiet for better reflection. 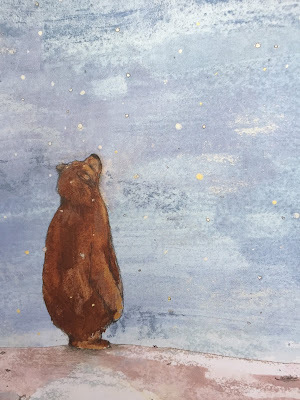 Then I simply asked my friends to hear and see the book while thinking of themselves as Bear. Once my reading was finished, I asked them to get comfortable while I asked various questions for reflection. Many questions flipped the paradigm: Does Bear remind you of a friend who needed to tell a story but you wouldn't listen? 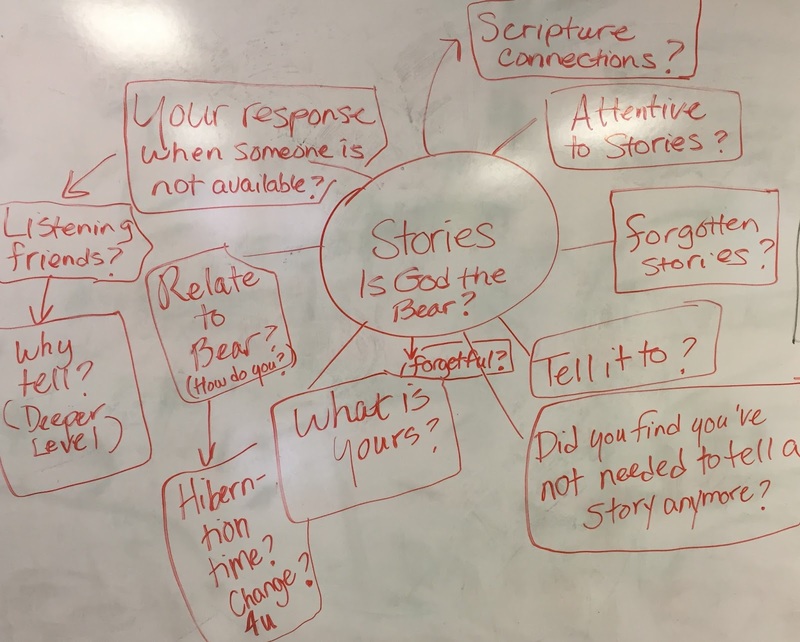 How is Bear like God? Where is the Holy Trinity in this story? After about 5 minutes of these questions, something interesting happened. My friend Elizabeth interrupted and asked for a sheet of paper. I had none. Then she said she needed to see the questions and asked if she could write them on the board. 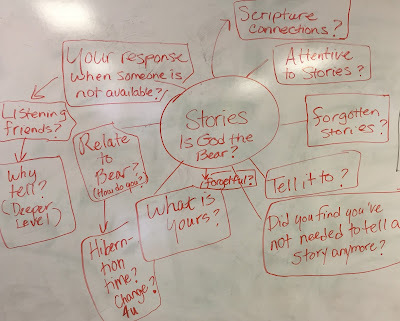 I said of course and invited folks to help us think again of the questions (I did not have them in my notes). The result is photographed at the end of this post. Her interruption made for a better lesson and was a reminder to me that I should always consider different learning styles. My hope for quiet reflection had given me tunnel vision. Thanks to my friend, the lesson was a great success. 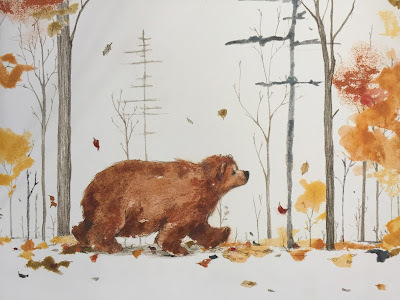 We could have talked about this great picture book with no hesitation for another half hour. Each animal is unavailable or busy preparing for winter. Bear helps them with their tasks. 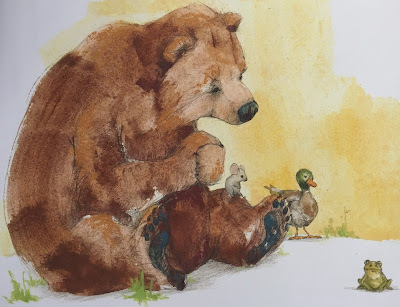 Then each animal friend scurries away or to sleep before hearing Bear’s story. 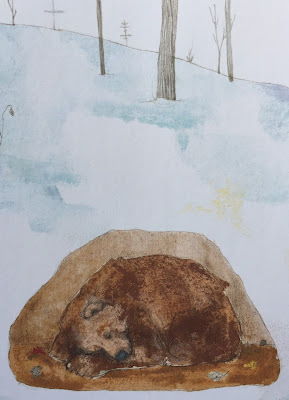 Bear hibernates. 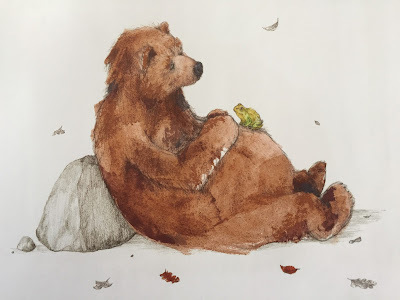 At the onset of spring, Bear greets each of his friends and asks again if they would like to hear a story. 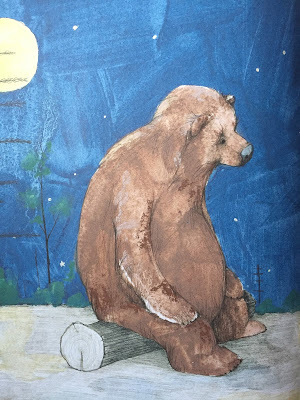 Hanna’s Comments: At first reading, my interpretation of this book was that Bear forgets his original story because he no longer needs to tell it. Time and helping others has allowed him turn loose of that story; a kind of healing of his need to be heard has taken place. 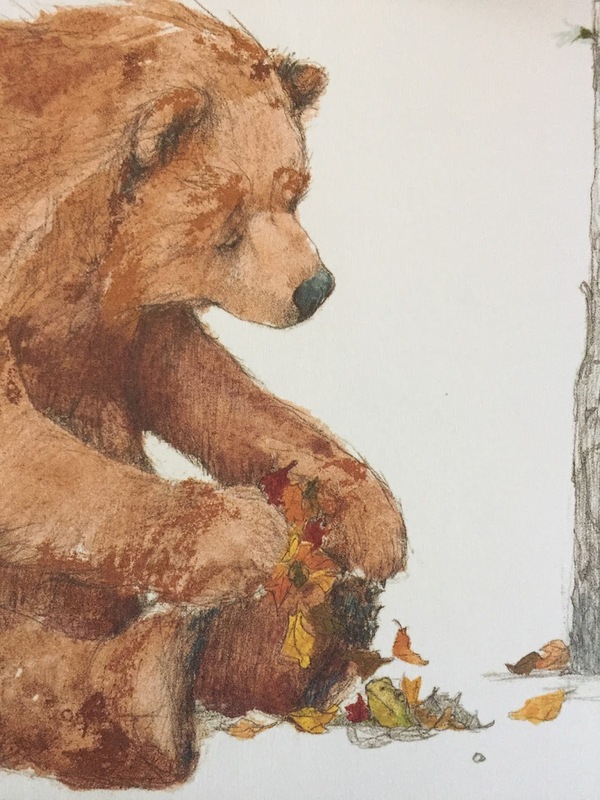 Instead, Bear tells the story of how he patiently set aside his need to be heard and helped his friends prepare for winter. Now I see so many other possibilities for theological or spiritual reflection and connection. This is truly a rich story especially if you're nearing Lent, a liturgical season remembering Jesus 40 days in the wilderness. 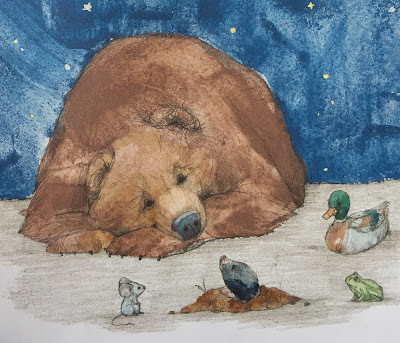 The hibernation of Bear and his friends is an easy connection. This Author/Illustrator duo has another book here at PBT. It is a treasure as well and was featured [here] at PBT on Day 9.